CRINCH! #CrabOfTheDay for 04/08/2017: Homola ikedai, or The "Ikedahomora" (イケダホモラ) is a Japanese, Sakai catalogued (1979) species of family Homolidae middle-water crab. This marine monster lives at mid-depths, (300 – 400 meters) and is known for its hairy, spindly legs. A member of an eleven-crab genus, H. ikedai was named for Buddhist philosopher, educator, author, and anti-nuclear activist, Daisaku Ikeda. CRINCH! #CrabOfTheDay for 04/09/2017: Scylla paramamosain, or The Green Mud Crab (トゲノコギリガザミ [Toge nokogirigazami] or “Thorny Saw-Grass Crab” in Japanese) is a South-East Asiatic mud crab, and a noteworthy commercial species in the region. 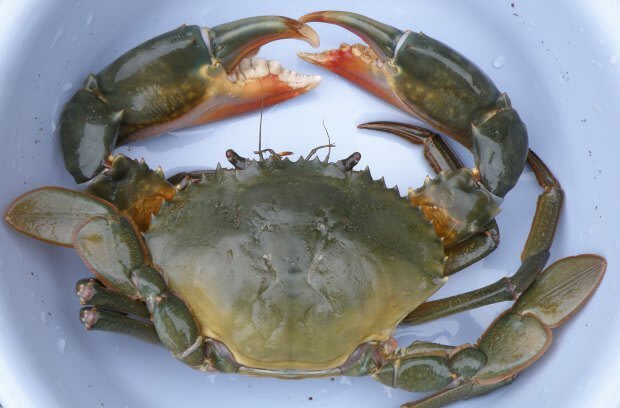 This family Portunidae crab, though native to Japan, Taiwan, China (including Hong Kong), Cambodia, Singapore and Indonesia, is gaining prominence via the aquaculture farms in Southern Vietnam. Originally thought to be a subspecies of Scylla serrata, S. paramamosain was later separately designated in 1998. CRINCH! 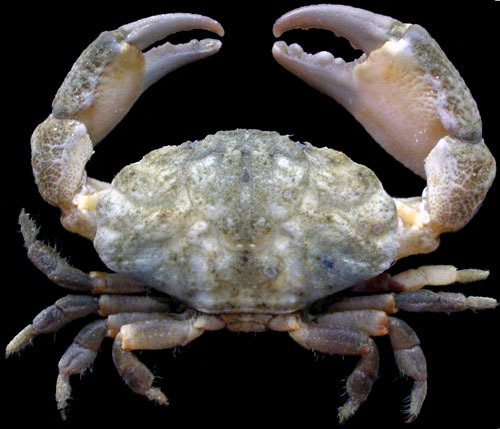 #CrabOfTheDay for 04/010/2017: Lophopanopeus frontalis, or The Molarless Crestleg Crab is an Indo-West Pacific species of family Panopeidae “Pebble” crab, which despite being designated by M. J. Rathbun in 1893, is often mistaken for other related crabs due to its rather indistinct appearance, persisting at least until late adulthood. Named for both its tooth-free chelipeds ‘molarless’ and its enlarged middle walking-leg joints ‘crestleg,’ this species is thought to use its rather bland, unassuming carapace as a means of camouflage against the rock and rubble of shallow seabeds. Photo Credit: Ng et al, 2008. CRINCH! #CrabOfTheDay for 04/12/2017: Tubuca paradussumieri, (Bott 1973) or The Spined Fiddler Crab, is an Indo-West Pacific species ranging from Northeastern India, Thailand, Indonesia, Malaysia, Vietnam, Cambodia, and China. This family Ocypodidae fiddler lives in high-biodiversity mangrove forests where the brackish, tropical waters are perfect for breeding/egg-laying. Known as an ‘Obligate Crab,’ T. paradussumieri juveniles will build chimney-like burrows in the soft mud of the mangrove banks. CRINCH! #CrabOfTheDay for 04/13/2017: The Coralthicket Hermit, or Goreopagurus piercei is a Gulf of Mexico native family Paguridae tropical species, usually found on the rocky ocean floor at the edge of the continental shelf. This rarely seen Hermit species shows a few morphological traits not often seen in other hermits including a shorter, narrower sexual depositor tube in mature males, and distally quadriserial gill placement. CRINCH! #CrabOfTheDay for 04/14/2017: The Big Handed Crab (Heterozius rotundifrons) is a family Belliidae species, endemic to New Zealand and surrounding islands. This diminutive hermit seldom reaches a size larger than 25 millimeters, (1 in) and is easily identifiable by its yellow-green carapace. Like other related hermits, H. rotundifrons males have greatly enlarged right claws. These cobble-dwelling scavengers have a very unique predation avoidance strategy: if disturbed they will freeze with their legs tightly folded and will remain so for some time, mimicking either inanimate objects or dead crabs. CRINCH! #CrabOfTheDay for 04/15/2017: Cyclograpsus lavauxi, or the The Smooth Shore Crab is a red and brown family Grapsidae/Varunidae species found in New Zealand and Chile. This appropriately named tidal dweller has a carapace that appears “polished,” with its two large eyes breaking up the effect. 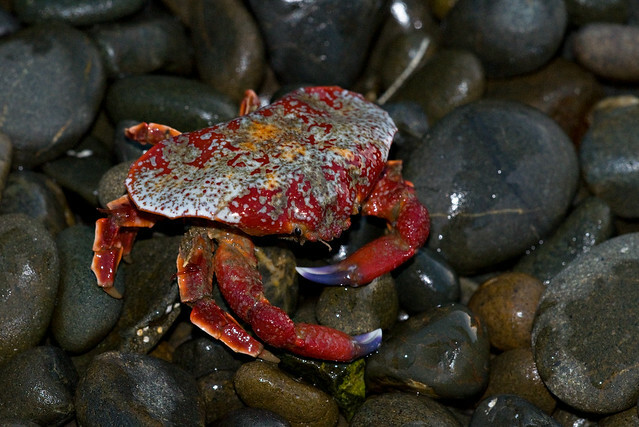 A fairly common crab on New Zealand shores, C. lavauxi will typically outnumber the larger common rock crab species by a large margin. Larger adult individuals are often found higher on the foreshore or mudflats than the younger Cyclograpsus lavauxi generations. This is most likely due to a difference in the scavenge-feeding requirements of the old vs. the young. CRINCH! #CrabOfTheDay for 04/16/2017: Eurynolambrus australis, known to the Maori as the “Riangi,” is a fantastic family Majidae species from New Zealand. 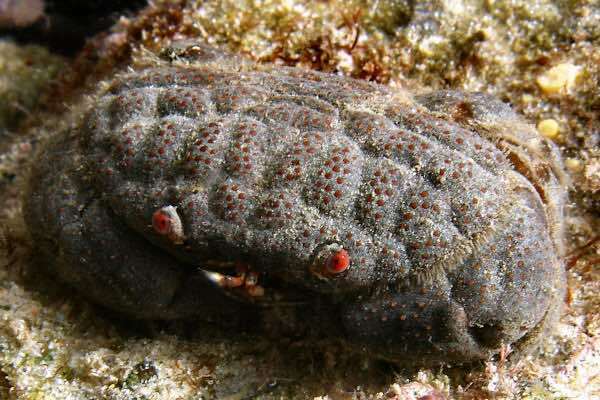 This triangular-shaped crab is brick read, and usually covered in a range of tubercles, knobs, lumps, and exogenous surface-growing marine life. A scavenger, these shallow intertidal dwellers are docile and will use a ‘play-dead’ defense if threatened. The primary diet of E. australis is the coralline algae, Corallino officinolis- so it’s no wonder that small blooms of this algae crop up on the hard to reach places of the crab’s body! CRINCH! #CrabOfTheDay for 04/17/2017: Xanthodius cooksoni, The Spoon-Fingered Crab (Miers, 1877) is a family Xanthidae species found in the East Pacific: from The Gulf of California to Chile- notably near the Islands of Baja, California, Sur, Revillagigedo, (Clarion, Socorro) Clipperton, and the Galapagos. This intertidal crab seldom gets larger than 30 mm +/- across, and tends toward the shallows on or about 5m in depth. Fun Fact: Xanthodius is a genus family Xanthidae crabs, containing one exclusively fossil species and five living ones. CRINCH! #CrabOfTheDay for 04/19/2017: Vellumnus vermiculatus, or The "Rough Eyed Crab," is a family Pilumnidae animal from the Indo-Pacific- notably Africa, the New Caledonian Exclusive Economic Zone, and Japan. 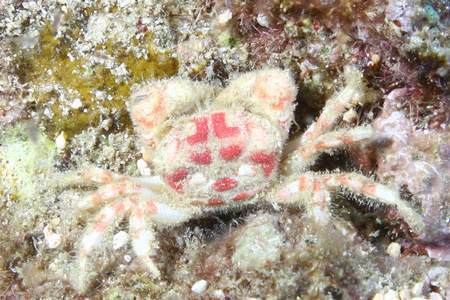 Known to the Japanese as “Meirokebukagani,” (メイロケブカガニ) and occasionally the ‘Monkey Faced Crab,’ this species is easily identifiable by the four distinct raised red sections on the back of its carapace. A rarely-seen detritovore, V. vermiculatus has recently undegone a re-naming, from ‘Pilumnus vermiculatus.’ (A. Milne-Edwards, 1873) As the genus Vellumnusbecomes better understood, it is highly likely it will be re-named again in the near future! CRINCH! #CrabOfTheDay for 04/20/2017: Lophozozymus dodone, called the 'Himehirobaougigani' in Japanese (ヒメヒロバオウギガニ roughly translates as “The Hidden Princess Plaza Crab!) 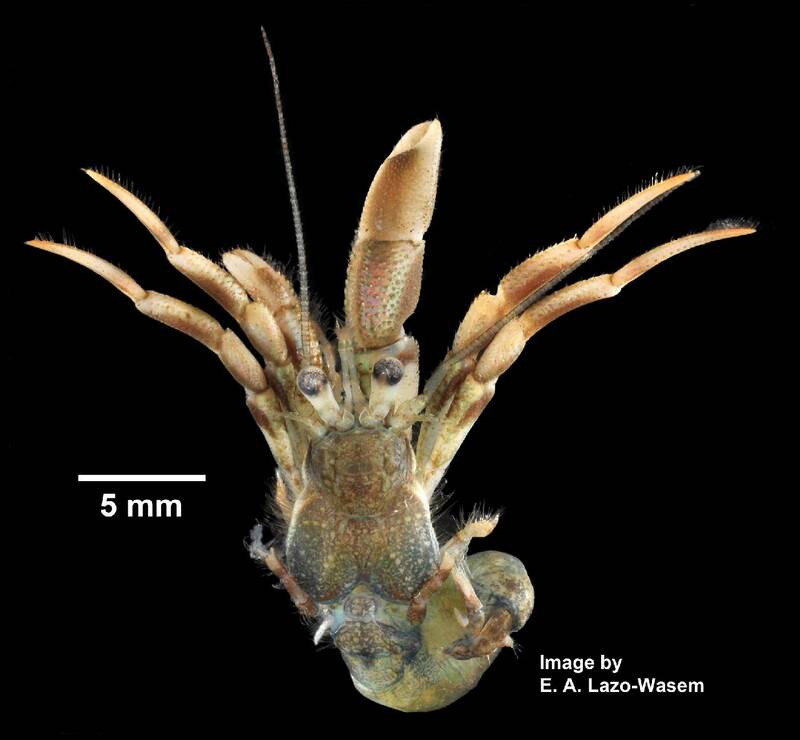 is an Indo-African/Pacific family Xanthidae species with some amazing claws, some rather diminutive walking legs, and a ‘boomerang shaped’ body. It is assumed that this reef dweller uses its red coloration and odd body shape as a means of camouflaging itself against reef corals and rubble. CRINCH! #CrabOfTheDay for 04/21/2017: Medaeus aztec (Davie, 1997) or The Aztec Crab is another family Xanthidae seamount and knoll-dweller, native to New Caledonia and parts of Southeast Asia. Re-designated by Queensland Museum alum Peter J. F. Davie in 1997, this reddish, oval-shaped, mid-depth (330 m - 348.5 m) crab is named NOT for the Aztec Empire, but the ‘Aztec’ scientific cruise during which the defining specimens were collected. CRINCH! #CrabOfTheDay for 04/22/2017: Liomera striolata, or the Striped Round Crab is a brilliantly colored Xanthid crab found in Oceania island groups like the Seychelles, Iles Bonin, and the Dampier Archipelago of Western Australia. 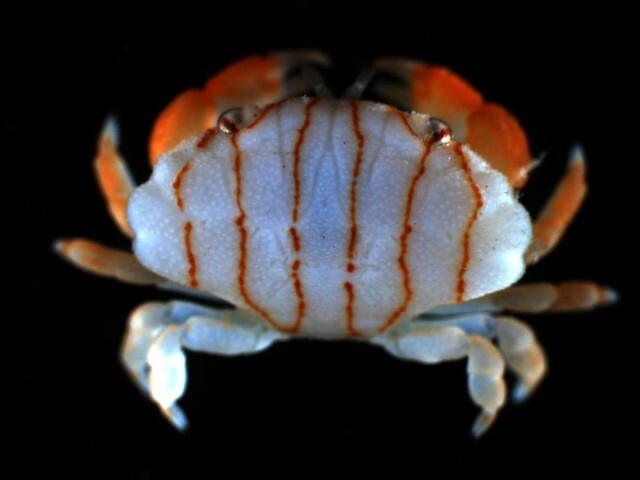 Known only from a few specimens caught, the Striped Round Crab can be identified by the presence of SIX bright red ‘furrows’ running longitudinally down its carapace. Associated with living OR dead Pocillopora spp. corals, L. striolata is one of two decapods that actually THRIVE during infestations of the corallivorous sea star Acanthaster planci. (The other being the shrimp, Neostylodactylus cf. littoralis) Weird! 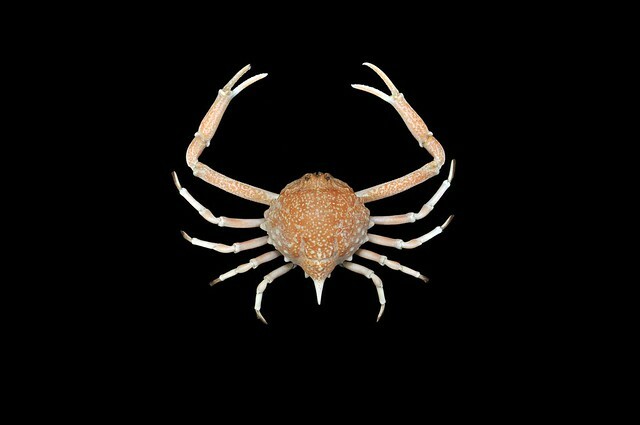 FUN FACT: Sealifebase.org lists this beautiful Tropical Indo-Pacific crab as “Harmless to Humans.” Good to know! Photo Credit: Moorea Biocode MINV Team. CRINCH! #CrabOfTheDay for 04/23/2017: Nursia mimetic, (Nobili, 1906) The Glass Coral Rubble Mimic Crab is a brilliant amber-colored member of family Leucosiidae, found in the Indo-South Pacific. This shallow soft-bed dweller generally hangs out in depths of 1 – 15 m and is characterized by its lack of ‘hepatic and transverse ridges,’ or, generally speaking convex carapace lumps. Instead, it has subdued depressions forming lobes on either side of its body. N. mimetic is a relatively small species, maturing at a carapace width of less than 5 mm across. FUN FACT: “Coral Rubble Mimic Crabs” (including N. mimetic) are said to be ‘mimetic’ crabs in that they try to mirror the appearance of coral in both shell morphology AND behavior! CRINCH! #CrabOfTheDay for 04/24/2017: Oreotlos etor, The Halimeda Mimic Crab, is a great family Leucosiidae species from New Zealand/New Caledonia, and the second of our recent mimic crabs! 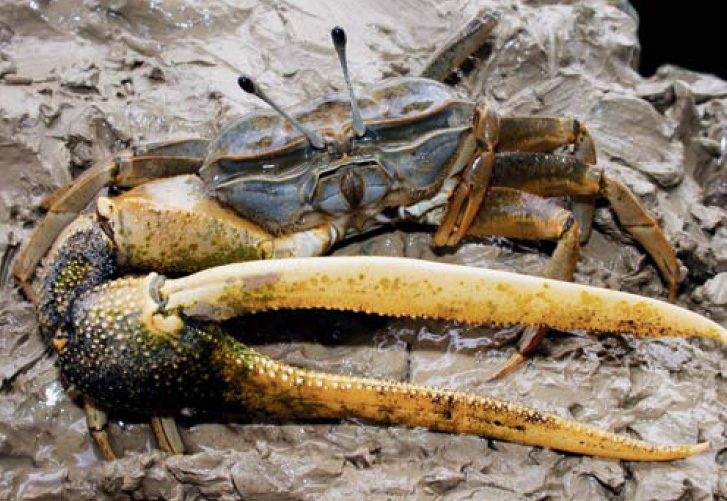 This Crab, commonly found in the lagoons of the area, exhibits several features, both morphological and behavioral, which allow them to look like individual fragments of Halimeda algae. However, unlike its cousin-species’ in genus Huenia, O. etor mimics dead, white (decolorized) Halimeda fragments. Friggin’ wild! CRINCH! #CrabOfTheDay for 04/25/2017: Actaeodes tomentosus, The Velvet Millet Crab (ビロードアワツブガニor “Birōdoawatsubugani” in Japanese!) is a coral-dwelling Xanthid with a furred, or ‘velvety’ purple carapace and orange spots on its legs. This ovaloid Indo-African/Pacific crab frequently finds its way into aquariums via purchased reef rock, and in later adult stages, tends to wreck up the joint as it is a versatile predator of a variety of tank life! Additionally, A. tomentosus is a carrier of the family Sacculinidae parasite, Loxothylacus torridus. CRINCH! #CrabOfTheDay for 04/27/2017: Calcinus lineapropodus, The Line-Legged Hermit Crab, known in Japan as the “Kazari Coral Hermit Crab,” (カザリサンゴヤドカリor Kazarisangoyadokari) is a brilliant family Diogenidae species of ‘Left-handed Hermit Crab.’ (Family Diogenidae). 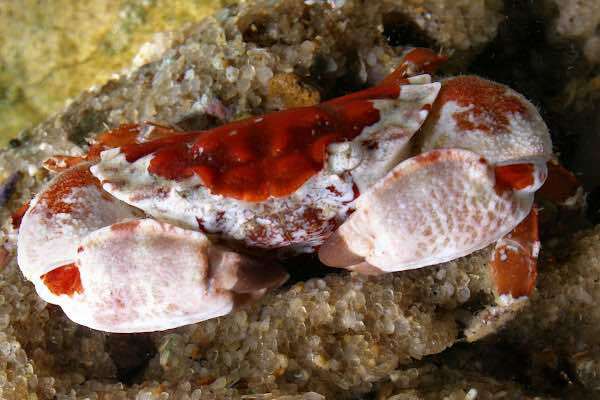 This widely distributed Indo-Pacific crab can be readily found in the shallow reefs near Indonesia, Micronesia, New Caledonia, and the Philippines. Only around ½ inches in body width, C. lineapropodus can be identified by its colorful walking legs with a last segment showcasing pink with black tips, with white segments above dark ones, with the namesake longitudinal stripes. CRINCH! #CrabOfTheDay for 04/28/2017: Glyptoxanthus angolensis , or The Florida Eroded Crab is a species of family Xanthidae crab, seen in Florida, The Gulf, São Tomé Island, and West Africa. 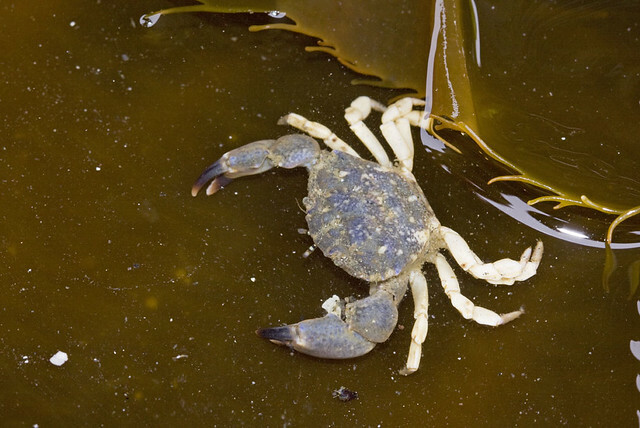 This peculiar crab lives in the rocky intertidal, shallow subtidal areas and is relatively rare in comparison to other genus Glyptoxanthus crabs. 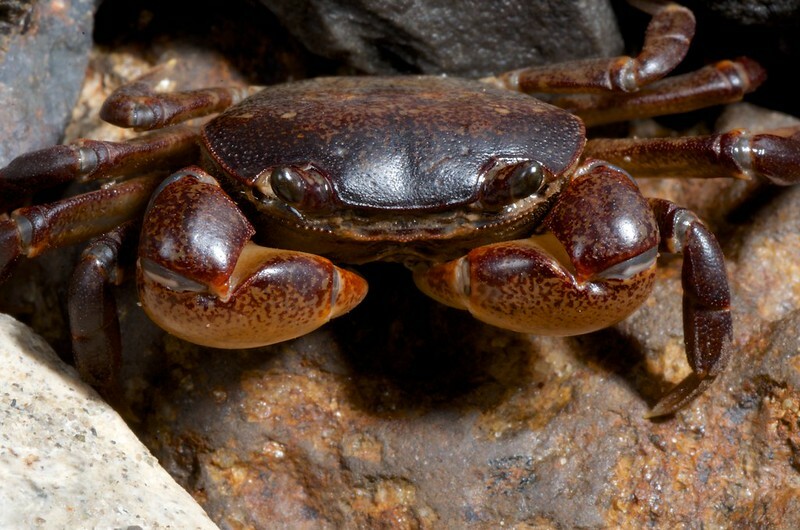 Due to its nondescript ‘eroded’ brown carapace, it is often mistaken for other crabs. 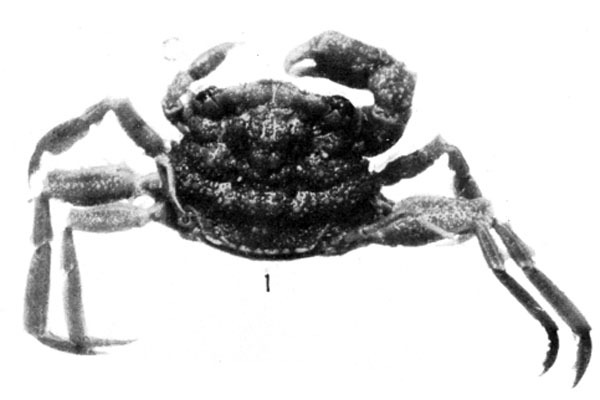 Originally an 1879 Alphonse Milne-Edwards catalogued species under genus Actea/subfamily Euxanthinae, this crab and its parent genus have a distinct morphology from other genera in that group, and were later placed (2011) in their own, monotypic subfamily: Glyptoxanthinae, by Jose Christopher Mendoza and Danièle Guinot. CRINCH! #CrabOfTheDay for 04/29/2017: Tanaoa pustulosus, or The Southern Globe Crab, (in Japanese, it’s called “Shirikenkobushi” or シリケンコブシ, meaning ‘Shiri Sword Warrior Crab!’) is an Indo-West Pacific Leucosiid, found near Madagascar, Australia, and Southeast Asia. 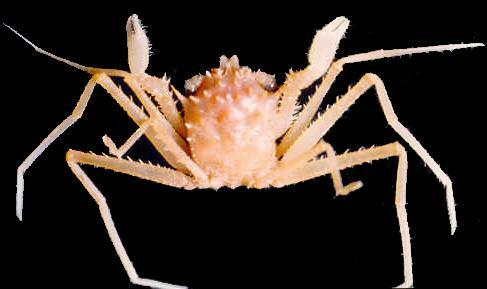 Inhabiting extreme depths up to and beyond 1000 m, this crab typically is only found dead and washed ashore. 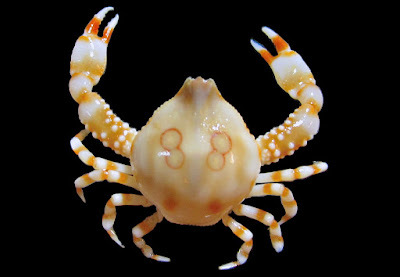 Detritovores, these crabs and other Leucosiid “Globe” crabs are named for their round central carapace; a trait most-likely developed as a means of dealing with the increased pressures at depth. Photo Credit: Victoria University Zoology Dept. FUNFACT: The Japanese call this guy “ツノクリガニ” or Tsunokuri-gani! Photo Credit: Bruno Welter Giraldes, Ibrahim Al-Maslamani, and David Smyth, 2017. CRINCH! 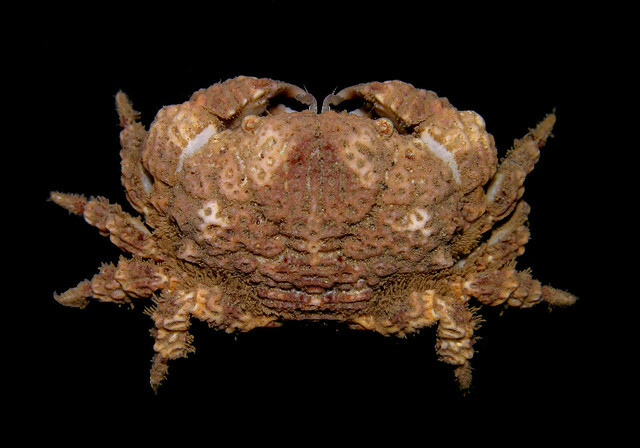 #CrabOfTheDay for 05/01/2017: The Arabian Gulf Purse Crab or Coleusia janani is an extremely recent discovery (April 12, 2017) in a very recently updated genus (Galil redescribed ‘Coleusia’ in 2006) now containing seven Indo-West Pacific crabs. C. janani is fairly closely related to its cousin species, C. biannulate, with its main distinction being a “straight upward apical shape of the male first pleopod.” (Meaning, it’s first-pair fast-moving twiddle-ly swimming legs are straighter and longer! SCIENCE!) 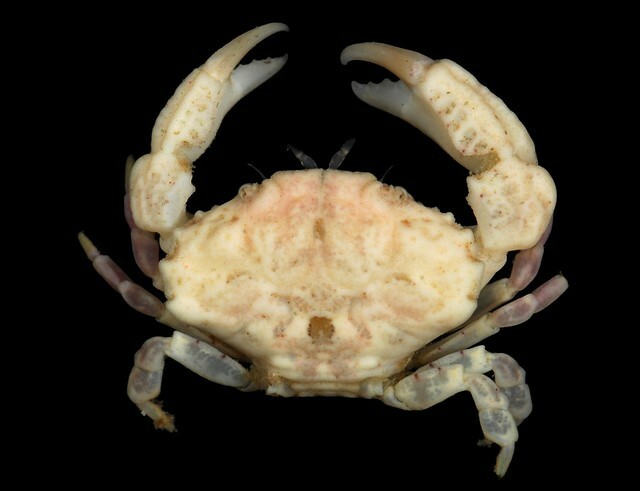 This family Leucosiidae crab has ONLY been found in the offshore sandy mixed substrates, (gravel and mud) in the Arabian Gulf near Qatar, at a depth between 22 m and 27 m.
FUN FACT: The Latin suffix ‘janani’ comes from the name of the Qatar University Oceanographic Remote Vehicle “Janan,” used in the discovery of this species! Photo Credit: Mary J. Rathbun, 1918. CRINCH! #CrabOfTheDay for 05/02/2017: Palicus affinis, or The Antillean Stilt Crab is a largely un-studied species of family Palicidae “Stilt Crab,” found mainly in the Gulf of Mexico, Central, and South American Atlantic Ocean. Possessing morphology uniquely designed for mobility and food scavenging in the cloudy, soft Atlantic beds, these crabs are largely depth-versatile- able to thrive from 20 m to 240 m! Due to the relative lack of recent photos and study on P. affinis, it may be a thesis-worthy topic for up and coming carcinologists! CRINCH! #CrabOfTheDay for 05/05/2017: The Mediterranean Slipper Lobster, or Scyllarides latus is a family Scyllaridae/subfamily Arctidinae species found in a variety of Atlantic Ocean Locales, namely the Mediterranean, Red, and Adriatic Seas. 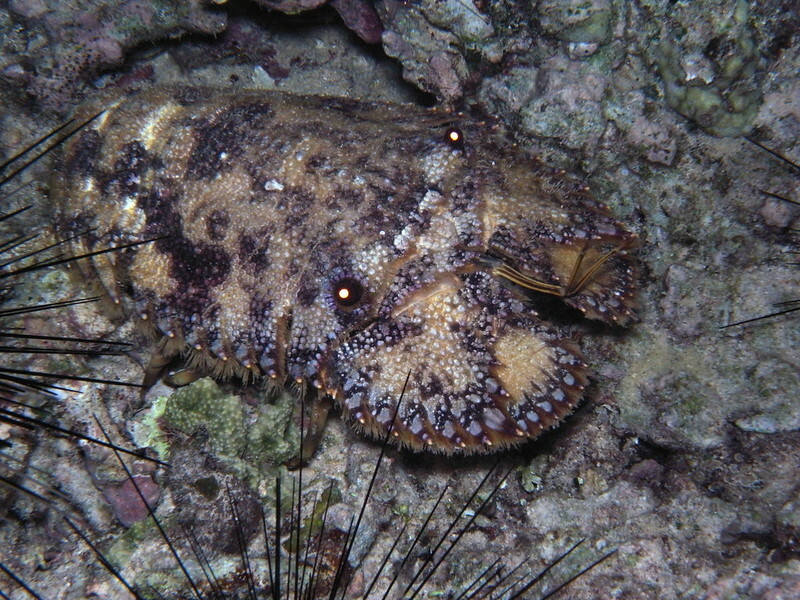 This Malacostran has the classic slipper lobster ‘clawtennas,’ here rimmed with a beautiful violet band. Due to its size (up to 1’ or more in length!) S. latus is very highly regarded as a delicacy by seafood enthusiasts. Some have theorized that its particular flavor profile comes from a diet mainly of mussels, limpets, bivalves, and other shellfish. They, in-turn, are eaten by bonefishes including grouper, triggerfish, wrasse, combers, and even genus Vulgaris Octopi. A recent boom in the popularity of the Mediterranean Slipper Lobster has placed increased pressure on the animal’s population- to the point where the IUCN Red List has indicated that due to “intense harvesting pressure in some areas, such as Italy and the Azores,” attempts at recovery of stocks may be too late.